The Charlotte County Archives and Museum houses collections dating back to the 18th century which reflect diversity, experience and achievement of Charlotte County People and welcomes researchers from around the world. The Archives are housed within the Old Charlotte County Gaol, built in 1832 it was used as a prison until 1979 and is a provincial heritage site. The buildings fascinating history and the eerie atmosphere never fail to leave an impression on visitors. Beside the Old Gaol is Charlotte County Courthouse, a national heritage site. 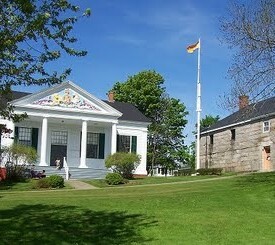 Built in 1840, it is now the oldest courthouse in Canada in continuous operation and is the best-preserved example of the typical mid-nineteenth century Maritime courthouses. Ghost walks available from June to September on Wednesdays, Fridays and Saturdays. Tours of both buildings are given June to the end of September.